Law professor Peter Sankoff is a respected expert in both criminal and animal rights law. 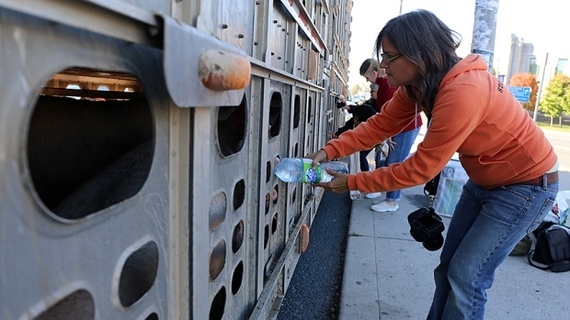 So when animal activist Anita Krajnc was charged with criminal mischief for giving water to a heat-stressed animal aboard a transport truck last summer, Professor Sankoff naturally took an interest in the case. He's analyzed the case in a video blog, on Twitter, and in the 'Globe and Mail', and here he answers a few questions about why he thinks Anita will be acquitted and how it's really the meat industry that's on trial. The farmer testified he believes he ought to have the right to decide how his property--the pigs--are interfered with, likening it to people feeding dogs without the "owner's" permission. You say the criminal law isn't the right legal tool for these situations. Why? The criminal law is not the correct tool for everything we might not like in society. It's a powerful instrument, and a blunt one, and we shouldn't use it lightly. Not every interference with someone's property constitutes a crime; nor should it. For example, I don't have the right to trespass on someone's property, but it doesn't mean that if I do trespass I've committed a crime. There's an important line (admittedly, a blurry one) between criminal acts and illegal ones. But we absolutely need to have that line in order to reserve the criminal law for the most seriously wrongful things in our society. It may be bad manners to give my dog food without asking me; it might even amount to a civil trespass, but it's nowhere close to being a crime. You think Anita will be acquitted. Why? The language of the Criminal Code is pretty clear. The Crown would have to prove beyond a reasonable doubt that she "obstruct[ed], interrupt[ed] or interfer[ed]" with the "use, enjoyment or operation" of the property. The section is not really designed to capture the conduct in question, and we should never bend the criminal law to capture a wider degree of conduct. Quite the contrary, actually. So let's look at the conduct. She had to have "obstructed, interrupted or interfered" with the pig in a way that affected "use, enjoyment or operation". I don't see how she could have possibly affected the "use, enjoyment or operation" of the pig by giving it water. The pig wasn't being "used" or "operated" when she gave it water. Those terms are applied to mechanical objects that are in the process of being, quite literally, operated. "Enjoyment" applies to situations, for example, where people are noisily stopping others from enjoying their back lawn. I don't see any reason why the court should apply those terms expansively in the circumstances. Doing so would widen the criminal law dramatically, making the person who gives a dog water without asking liable to mischief charges. It is an absolutely cardinal principle of the criminal law that you need to actually violate the law as drafted before a conviction can be entered. So before I even consider whether she was right to do what she did, I just don't see any crime here. If a mischief offence could be made out against Anita, there are a number of defences available to her. Which defence do you think is her strongest option and how would you argue it applies? Lots of possibilities here. I'm partial to de minimis myself - the notion that "the law should not concern itself with trifles". The offence charged here is that she interfered with the pigs, which did not belong to her. I'm not convinced this is an offense at all, but if it is, it's a trifling interference. The de minimis defense is essentially an expression of what I talked about above: some transgressions might technically amount to an offense, but they should not be punishable, because they're not serious enough. I also like the defence of colour of right, which essentially allows people to raise a mistake of law in relation to property offences. Krajnc believed she was legally entitled to provide water to animals in distress. If the court finds that mischief was committed, it means she wasn't, but her honest belief that she was is a defence to these sorts of offences. Normally, people cannot raise mistakes of law, but crimes involving property are so problematic to resolve that we allow people to say "I thought I had the right to do this" and escape liability. Outside of the mischief charge and even the likely transport violations, what animal rights law issues are being raised? Plenty. I think it's interesting to see how the transport industry is the one really being put on trial here. Whether or not the pig transporter complied with the law governing transport, the public is getting a crash course in how troublesome the law is. In the 'Globe and Mail', a pork industry spokesperson noted that "the regulations followed by farmers are developed alongside animal-welfare experts and overseen by the Canadian Food Inspection Agency." 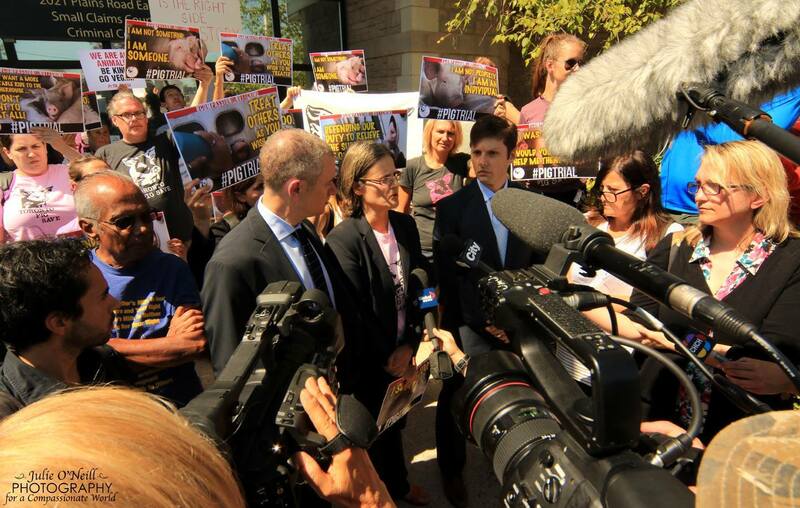 All of this is technically true, but examining the statement in light of this trial gives us an opportunity to explore the way in which the law can be manipulated to serve ends that are not animal-friendly. If I make my own rules--and let's just say that the industry has a large role in setting the rules that are followed--it's usually easy to follow them. If you're allowed to transport pigs for 36 hours without giving them water, what does it mean to say you are "following the rules?" The question is not whether you're adhering to the rules, it's whether the rules themselves allow for abusive conduct. That's what I think is really on trial here: how our law allows conduct that leads to the suffering of animals in transport to happen.